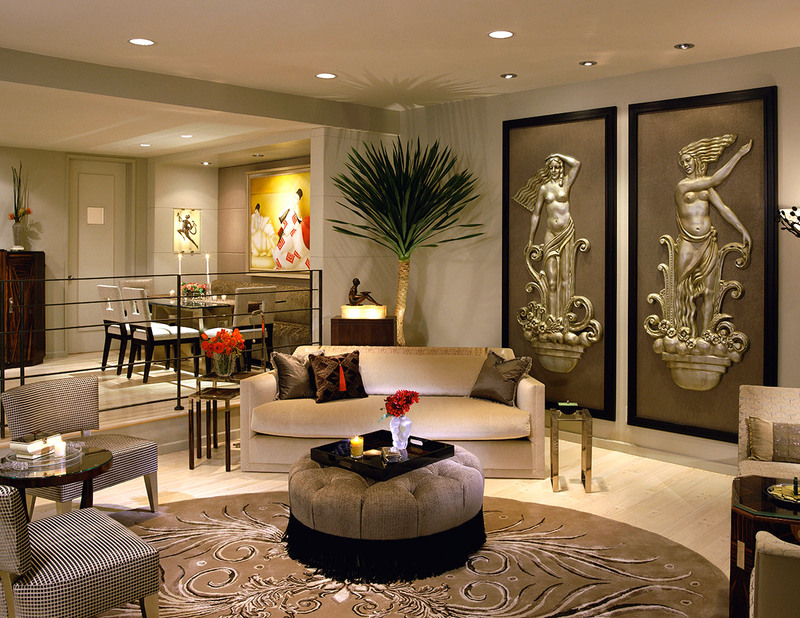 Living Room/Dining Room - This project won 1st PLACE in the 2008 ASID/LA – EXCELLENCE IN DESIGN COMPETITION for RESIDENTIAL UNDER 2,500 Sq. Ft. The custom designed oval rug creates a seating in the round. The furniture floats away from the walls, allowing each piece to be viewed as a sculpture. This composition gives the room a sense of movement and space. 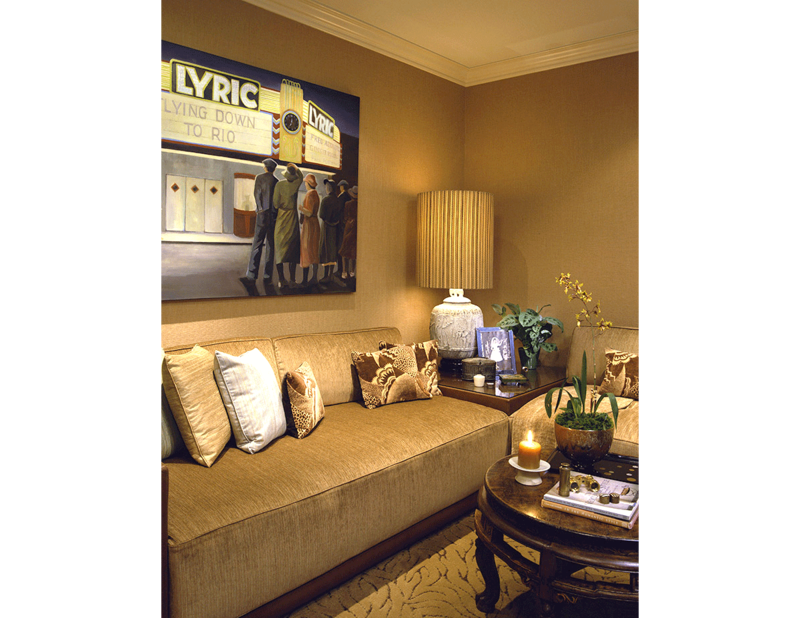 Living Room - The framed Art Deco appliqués on the wall once hung in an elevator vestibule of a Miami Beach hotel. 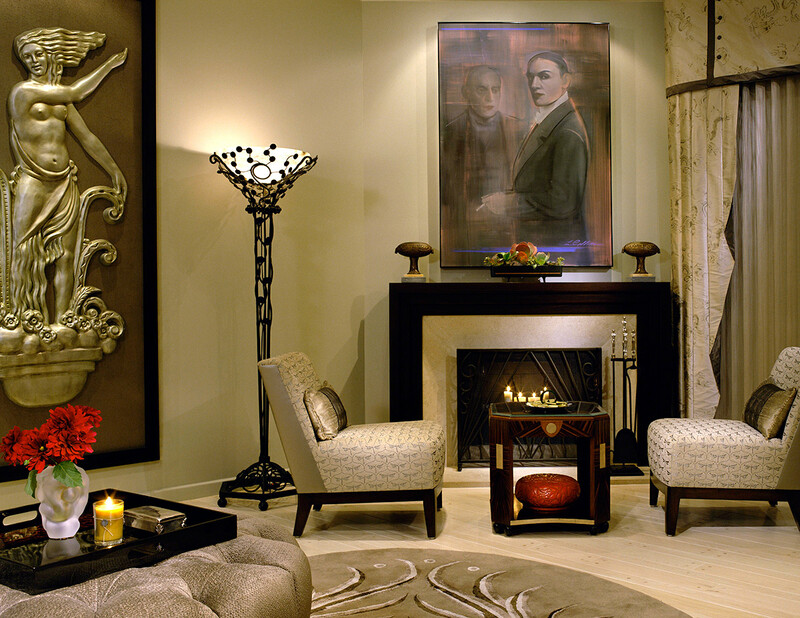 Living Room - The floor lamp is an Edgar Brandt reproduction. The existing 1970's fireplace was transformed. A custom step detailed mantel is installed over the existing stone, creating a more clean line Art Deco look. The curtains are hand stenciled silk with bronze silk borders and buttons. The sheer panels are a silk mosquito net-like mesh. Dining Room - The pony wall, that once divided the upper dining room from the lower living room, was removed and replaced with a bronze railing reminiscent of an old luxury liner. 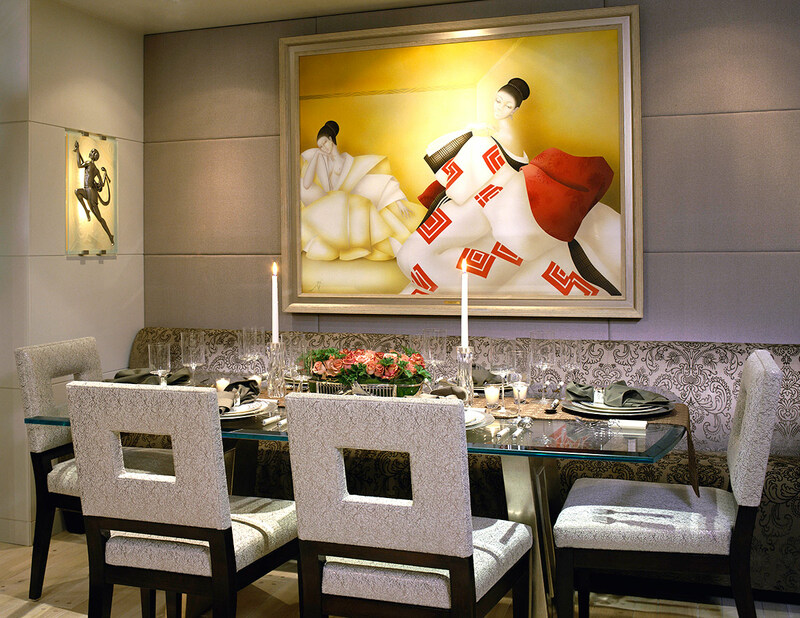 Dining Room - The walls of this dining niche are upholstered and include a built in upholstered banquette. 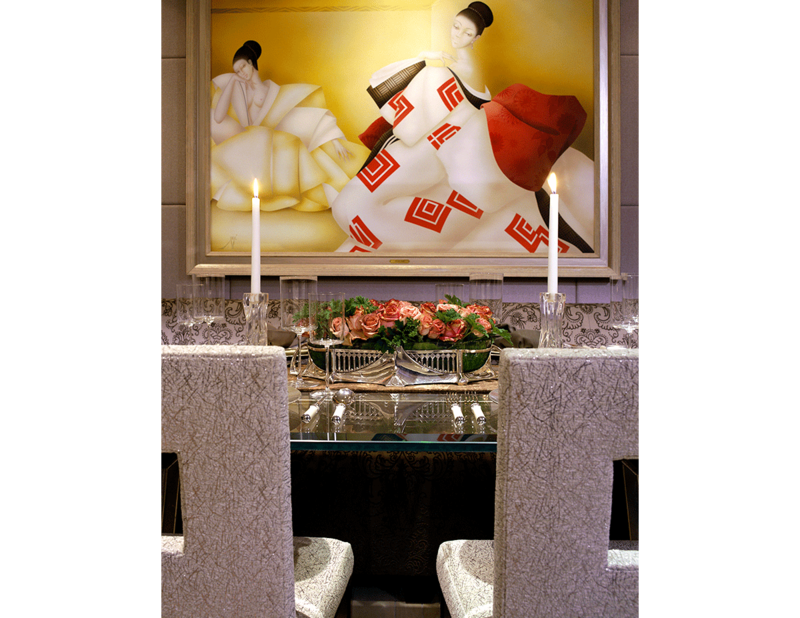 A framed and over scaled picture of Geishas hangs on the wall. A pair of Art Deco Lalique panels, with polished pewter appliqués of dancing women, flank the inside of the dining niche and are lit from behind. The custom dining table consists of a glass top with beveled edges and a silver leafed wooden base. the rectangular opening in the table base's legs is repeated in the backs of the upholstered dining chairs. The fabric on the dining chairs has silver flecks. 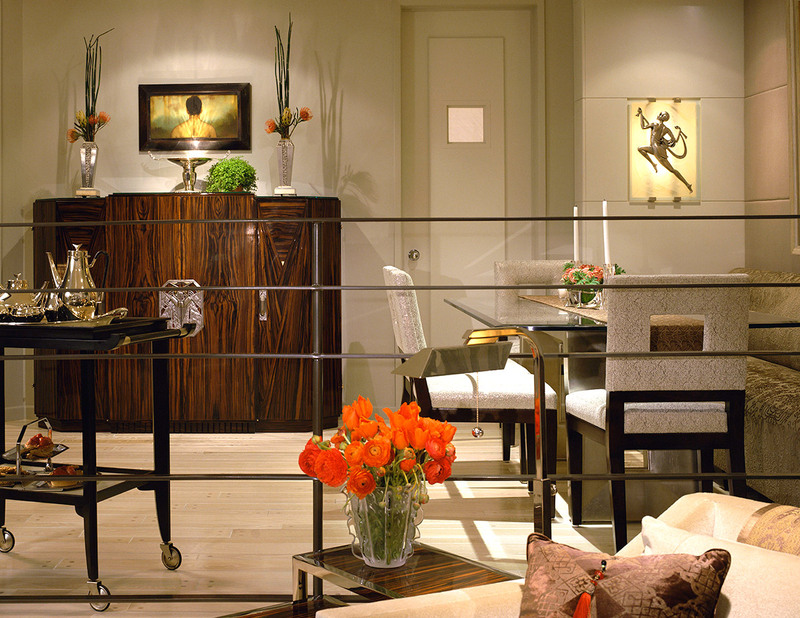 Dining Room - A silver Art Nouveau cachepot sits atop the center of this custom designed glass table. 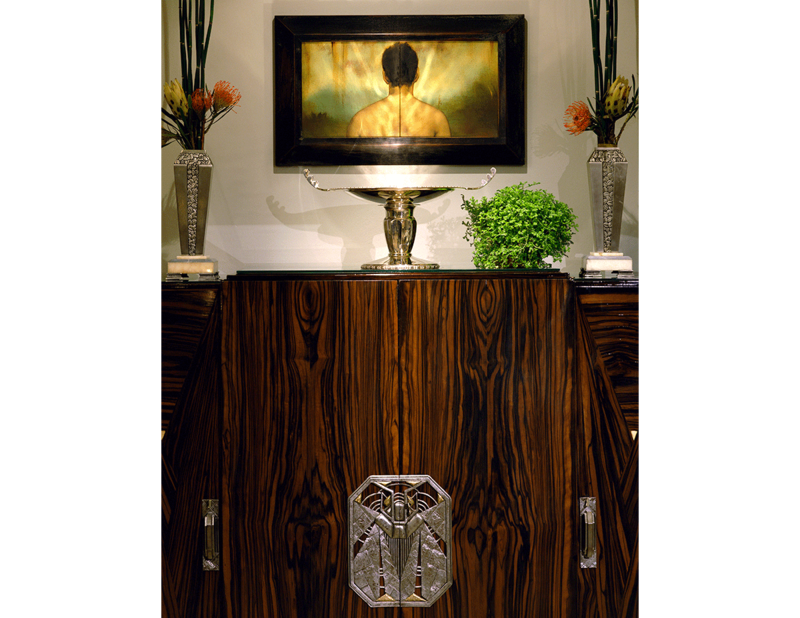 Dining Room - A detail of a fine Art Deco Macassar Ebony China cabinet, dressed with a wonderful pair of cast bronze Art Deco urns and an elegant silver cake dish. Hanging above the cabinet is a contemporary painting of a man looking to the horizon. The light reflecting off the dish helps to enhance the rich colors in the painting. 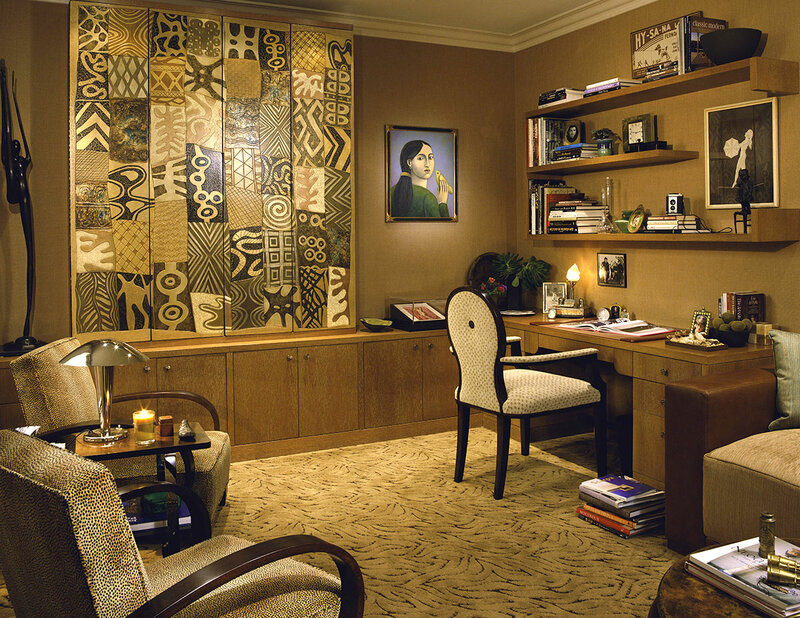 Guest Bedroom/Home Office - Behind the 1930's gesso and gold leaf folding screen, turned decorative door panels, is a flat screen TV. The custom cabinetry is in rift oak and the walls are covered in silk burlap. Guest Bedroom/Home Office - The built in seating, with integral table, doubles as two twin size beds for visiting family and friends. The retro lamp, circa 1950, is a ceramic pot in blue and rust and embossed with a family of Indian pachyderms in parade. 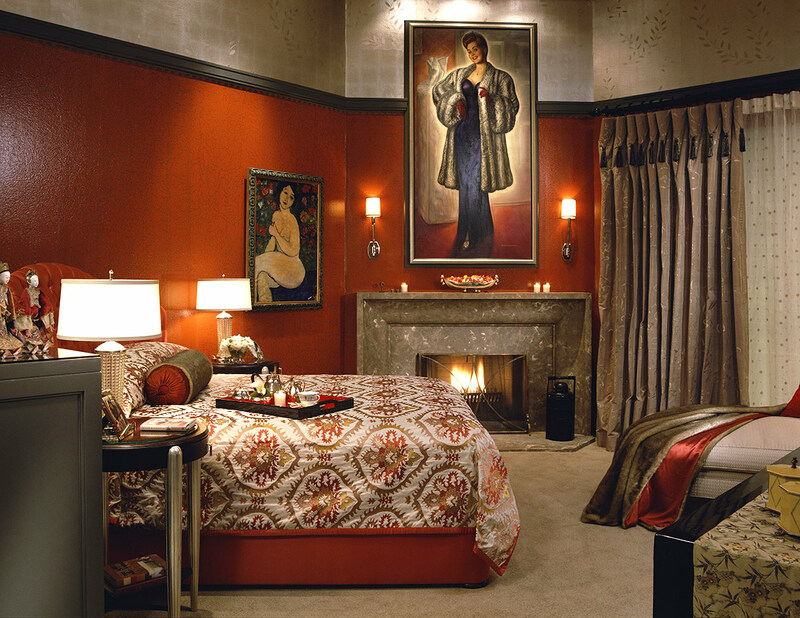 Master Bedroom - The walls of this room are crackle glazed China red with a dark taupe/brown bole. The glass panels behind the bed slide open. Behind them is the client's treadmill. She can open the panels and watch TV while exercising. Master Bedroom - The ceiling height in this bedroom is 16 feet. An added picture moulding creates an oversized frieze, which is covered in a hand embossed white gold leaf tea paper from China. Above the fireplace, and for a touch of whimsy, is a portrait of a B-movie actress from the 1940's. Master Bedroom - The faux fur throw on the chaise is backed in a soft silk taffeta. The goblet pleat curtains are in hand stenciled silk with black silk tassel details on the heading. The sheer panels are hand embroidered with tiny cultured pearls in snowflake-like clusters. 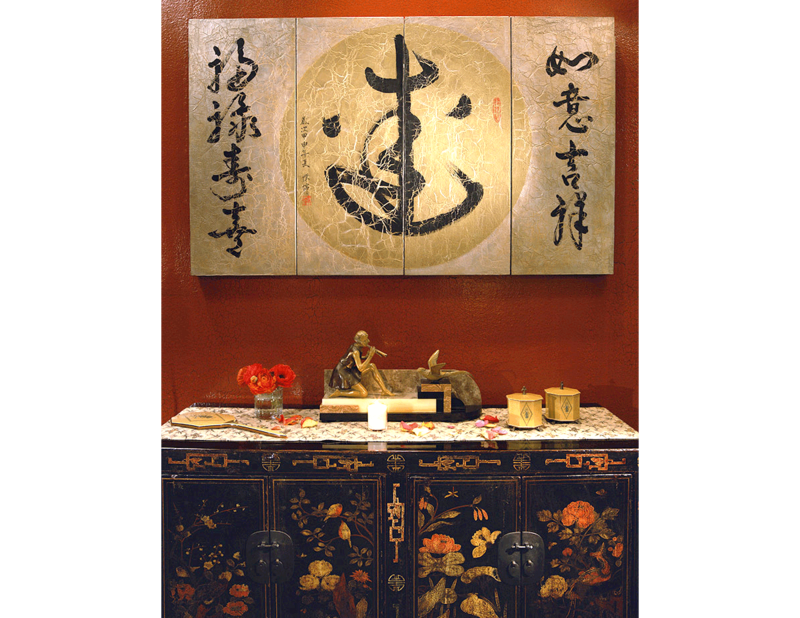 Master Bedroom - Behind these custom Chinese character hinged panels is a flat screen TV.